Process the cauliflower in a food processor until finely chopped. Place into a microwave-safe bowl, cover and microwave on high for 8-10 minutes or until very tender. Drain through a fine sieve, pressing down well with a spoon to remove excess liquid. Combine the cauliflower, egg and parmesan in a bowl. Preheat oven to 230°C. Line a 30cm round pizza tray with baking paper. Press cauliflower mixture into the tray. Bake for 20 minutes or until golden. 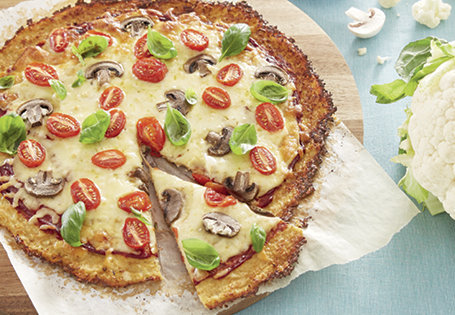 Spread tomato paste over the base and sprinkle with mozzarella and sliced tomatoes and mushrooms. Bake until cheese is fully melted and tomatoes are blistered, then remove from oven and add basil leaves.